If you haven’t already read part one, you can check it out HERE. My folks retired to Tucson, Arizona a few years ago and after meandering around Colorado, Utah, and Northern Arizona, I spent a week visiting them and exploring the Sonoran desert. In 1972 forward thinking Tucson passed an ordinance that strictly limits artificial light pollution. It was originally intended to conserve energy and preserve the crystal clear dry desert air that has drawn star gazers to the area for a century. Now astronomy is big business in southern Arizona. Many of the state’s federal and university observatories are located there. The Steward Observatory Mirror Lab, which makes mirrors for the world’s largest telescopes, is located on the U of A Tucson campus underneath the stadium. 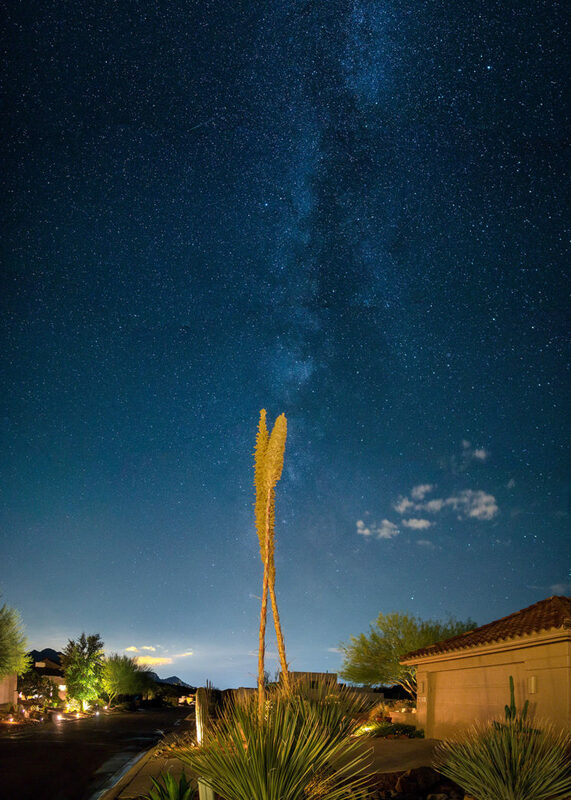 In Saddlebrooke, a retirement community about 20 miles north of downtown Tucson, you can step out into your front yard on a clear, moonless night and see the Milky Way. Houses can have decorative landscape lighting, but there are no street lights and very little orange light pollution glow. The photo below is a single wide-angle vertical exposure of the late autumn Milky Way behind a decorative Bear Grass plant next to the driveway. In Ohio I have to drive an hour and half away to get skies this dark. Between Tucson and Saddlebrooke is the much beloved Catalina State Park. 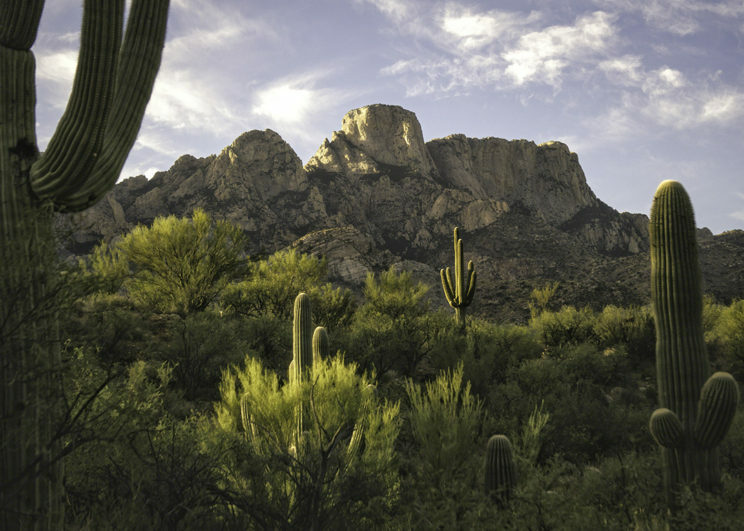 When you think of the deserts of the American Southwest, Catalina State Park is what you picture. Desert, Saguaros, mesquite trees, mountains, arroyos, and sand. On an early morning visit to the park, before the temperature climbed to a million and a half degrees, I captured this shot of the iconic landscape. The park also features some natural pools and a couple small waterfalls during the monsoon season. Yes, Arizona has a monsoon season from about mid June to mid September. They don’t get a lot of rain year-round, but the rains they do get can be torrential. Visiting most of the year, you can be forgiven for wondering why there seems to be so much infrastructure dedicated to moving water that isn’t there. During the monsoon rains, when 50 foot wide rivers suddenly fill to capacity, it becomes obvious. My visit came at the very end of monsoon season and we didn’t have any big storms. One smaller storm did put on a bit of show. When it looked like we might get some lightning right around sunset, I rushed to the top of a nearby hill (with a metal tripod – genius, I know) and took about 150 long exposure shots of the approaching rain storm. 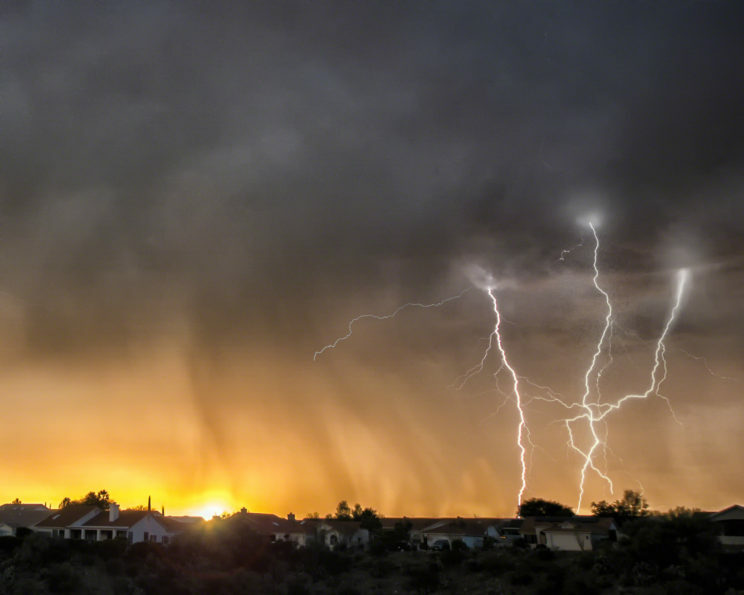 Three of those shots captured lightning strikes. I combined those three shots into the single image below. In addition to the endlessly interesting skies, Saddlebrooke is a great place for birding. 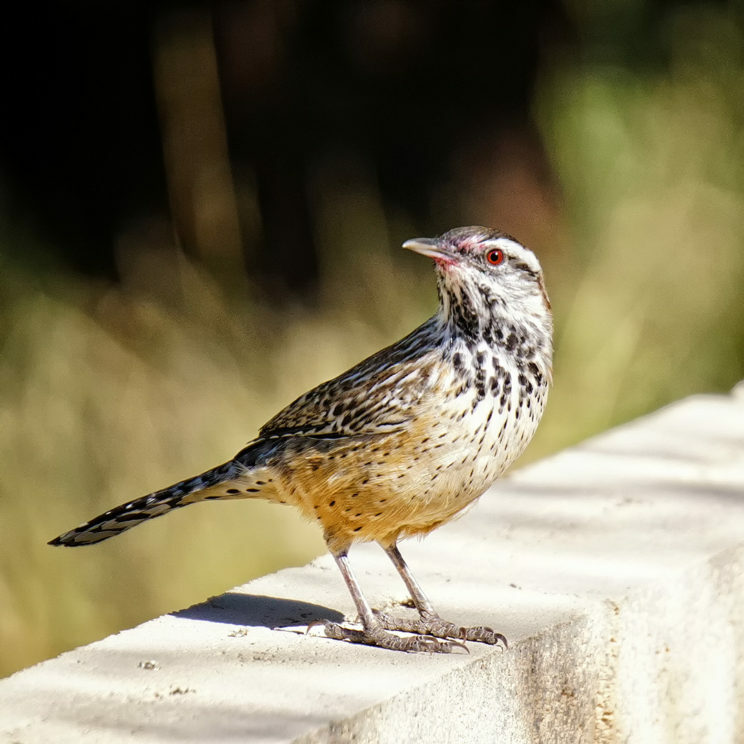 Just sitting around in the backyard with a telephoto lens I was able to get shots of hummingbirds, quail, roadrunners, verios, woodpeckers, curved bill thrashers, and this shot of a curious cactus wren. About an hour further north of Tucson, near Winkleman, Arizona, is the western entrance to the Aravaipa Canyon Wilderness. 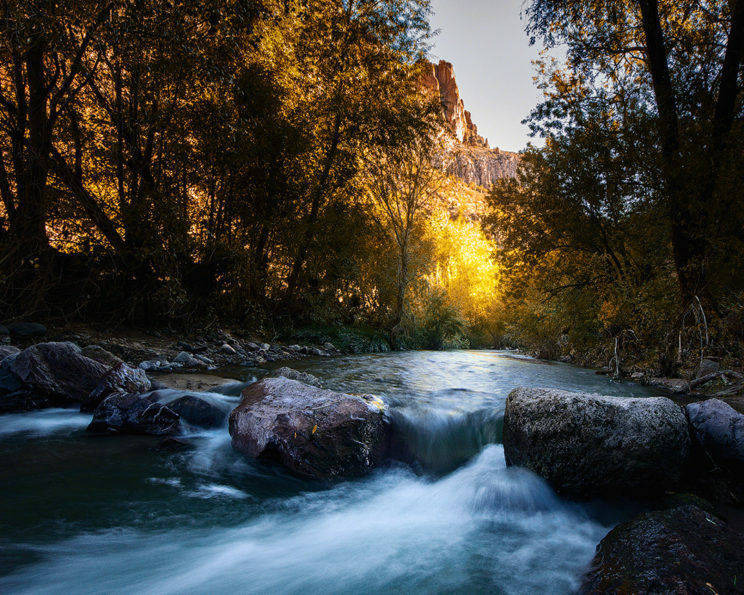 Aravaipa Canyon is an unexpected riparian wonderland in a deep 10 mile long canyon running through the Galiuro Mountains. Aravaipa Creek runs year-round fed by springs, seeps, and tributary streams. The water has cut a canyon that is 1000 feet deep in places and so narrow in others that sometimes hiking in the creek is the only option. Numerous side canyons offer endless chances to explore. On the downside, it’s not somewhere you’d want to be during a sudden monsoon rain and there are venomous snakes, mosquitoes, and even in the usually dry desert the humidity in the canyon can be extreme. Late fall and early spring are probably the best times to visit and I was lucky enough to visit in Early October. I got up about 4AM to be able to get to the canyon a little before sunrise. The last 12 miles of the drive are on a twisty, rocky dirt road. You do have to have a permit from recreation.gov to visit. While I’m all for the permit system and of course support the BLM, paying a $6 online booking fee for a $5 wilderness permit is just stupid. The photo at the beginning of this post is a shot of the 600 foot high far canyon wall seen from one of the many bends in the creek. I only made it a few miles from the western entrance before it was time to turn around and head back. The shot below is a small cascade near Cave Canyon where I turned around. I’m eager to go back the next time I visit Arizona and explore more of this incredibly beautiful place.